Our office moved into a new space within our building which has an unique artwork made by the famous artist Laser 3.14! We're really excited about the fact we can now host your team in a room painted by the Dutch Banksy :-) Learn more about Laser 3.14 via this great article by De Correspondent. At Room of Riddles we try to create 60 minutes that you're in a complete different experience than your normal life. No messages, no e-mails, no Facebook, no Google...so no phone. We introduced a simple solution for this: a wooden box in which your team can store your phones, which is locked up during your escape game and opened again once your team escapes. The guys of Distractagone came up with a similar idea, but the execution is really next level. They want people to enjoy their social lives more and offer a simple solution: a box in which you can lock your phones, but set on a timer. Ideal for dinners, romantic evenings, game nights and so on. Distractagone is a hit on Kickstarter and we hope they will reach their goal soon, so it can go into production. We ordered a bunch for Room of Riddles, but what are you waiting for: order your own Distractagone! We're honoured by the fact that the logo of the Design & Emotion conference is inspired by our logo. We think of it as an "impossible³" (cubed impossible), a three-dimensional impossible figure, represented by a two dimensional square. When starting Room of Riddles, the laptop with design-tools broke down and hence we needed to find a workaround to design the logo. We hence sketched the logo in, hold your breath...Powerpoint! After the draft was done, a friend of us actually rebuild it in Illustrator to make the files required for the printer. We got many compliments about our logo so far, but this contribution by an international conference might be the best! For already a few months we are building our newest escape room experience: The Hacker! Hereby the first introduction to the storyline: It's the evening before prosecutor Mrs Johanssen will reveal the identity of the famous hacker Chr0nos. On the Dark Net, rumours surfaced that Chr0nos wants to stop her. Your job as a team is to monitor Mrs Johanssen apartment and prevent anything happens to her. You have a control room with live video surveillance and many gadgets at your disposal - but will you manage to save her? The Hacker will open on the 13th of June 2016. We look forward to meet you in The Hacker! We love spoiling our guests with some snacks and drinks. Every week we go shopping for this and this time we where in a festive mood, so we brought some kilo's (many bellies to make happy) of cookies, chocolate and candies! Enjoy! We're incredibly proud to have developed three escape games for Room of Riddles in Barcelona! It's been open already for over 2 months now, so last weekend we went back to check how things are going. It's situated on a unique location, in the former Olympic Village right next to the Olympic Harbour and the beach where all the famous clubs (Pacha, Opium) are. Room of Riddles Barcelona already hosted a great amount of events (for example for 40 people of the Royal Dutch Shell) and when we arrived at 9 o'clock in the morning a group having a bachelor weekend in Barcelona just got locked up. We love Barcelona, it's an incredible city situated at the Mediterranean sea. The unique blend of culture, the beach, great food and nice weather makes a great hub for international companies and visitors from all over the world. We translated two main themes of the city, art and the harbour, into the storylines of the rooms. In the Harbour Master you enter the office of the Barcelona Harbour, in order to become the manager of the Harbour. In the Art Collector (as shown on the image) you step in the office of Mr. Fabiolo, a famous art collector who just passed away. In order to find his final will, he created a last little riddle for you... In the room you will find all major Spanish artists, like Gaudi, Picasso, Dali, El Greco and Miró. And after your team escaped Room of Riddles Barcelona, the team in Barcelona also arranges affordable sailing trips, helicopter flights and tours in supercars like Ferrari's! 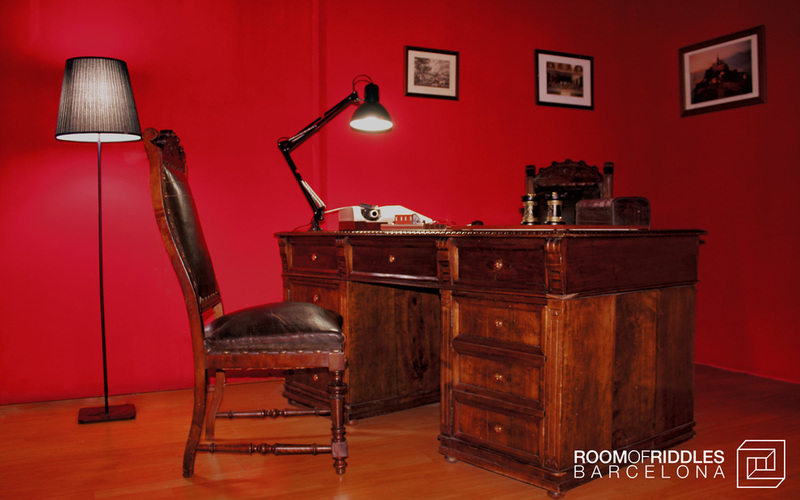 Just contact the Room of Riddles Barcelona team to arrange many cool activities while visiting Barcelona. Enjoy! We're proud to have the coolest Riddle Masters in our team. One of them is the talented Marta who plays the piano, guitar and...bass guitar! And she now rocks in the band Floatmonki. Yesterday they released their first EP at their release party in Roest and the Room of Riddles team was there - we loved it! So listen to their EP below and don't forget Marta to sign your CD when you drop by at Room of Riddles Amsterdam! We love team-outings! Today we prepped our meeting room with a flip-over, Rubic Cubes and a M&M machine for a team of the beautiful Van Gogh Museum in Amsterdam. The food and beverages will be arranged by our in-house caterer who bakes delicious croissants and has the best coffee ever! If you're interested in hosting your team outing at Room of Riddles you can surely just book an escape room as the game comes standard with a welcome in our reception area and a debrief including drinks. If you also want to book a meeting room, flip-overs, beamer and catering, just ask our team via our team outing page! WOW: we had a marriage proposal in our escape room! Amongst the many great moments we experience with are guests, this one truly stood out. We loved to be part of this experience and wish the soon to be newlyweds much luck and love! PS. In case you're interested in doing something similar, just contact us, we love to help you! "Room of Riddles is actually a real good excuse to get anything we find cool and inspiring", says one of the Room of Riddles developers. The story goes that these plane miniatures where amongst the first things bought when building the first escape game in Amsterdam. Once a guest who solved the riddle with the airplane, gut stuck in the game. After the game we found he used the wrong airplane type code. He stated "they don't fly these anymore, so I kept pressing the number of the common type these days". Our bad, we're not that expert ;-). Remember these from back in the days? These patience cubes look so simple yet are so hard to complete. We made Room of Riddles versions to give you a warming up of the mind and senses when getting briefed in Amsterdam - hope you like them! We're about to open our SECOND escape room called the Birdcage. And to make your escape experience and team outings as awesome as possible...so we ordered 5000 golden balls for a ball pit! Hope to see you soon, just book the Birdcage. We're proud to be covered on the National News of RTL4! Only a few weeks after opening a TV crew with an interviewer and huge camera passed by. Little did we know our shared kitchen was up for renovation that day so we had like 30 minutes to remove all tools and dust before the camera's started rolling, haha! But all went fine, we hope you enjoy the newsitem! Awesome: we made it to the national television news! We cannot express enough how thankful we are for all the endorsements and likes which made this item possible!! THANKS! Het Parool, a famous Dutch newspaper, just came by to play Room of Riddles and write an article about it! They first played the game and after that we had a photoshoot. They where great fun. And thanks for the awesome article (in Dutch)!